Tanner Lemaster pitches for the Washington C.H. 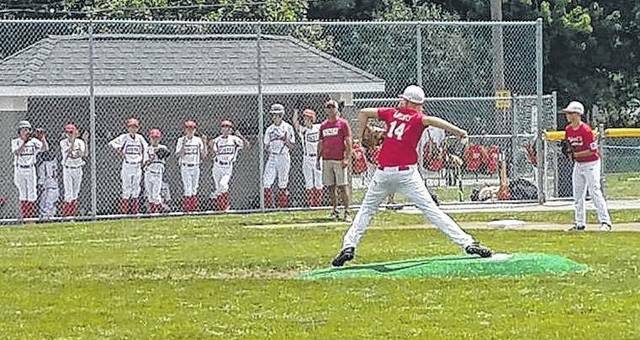 12-year-old all-stars in the State Little League tournament against Dover Tuesday, July 18, 2017 in Maumee. 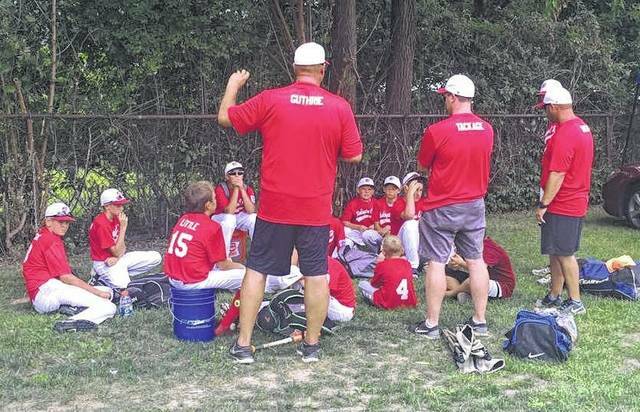 The coaches talk to the all-stars after an 8-1 loss in the State Little League tournament in Maumee Tuesday, July 18, 2017. The Washington C.H. 12-year-old all-stars line up to receive their commemorative pins after bowing out of the State Little League tournament following an 8-1 loss to Dover Tuesday, July 18, 2017 in Maumee, Ohio. MAUMEE — The Washington C.H. 12-year-old all-stars saw their State Little League tournament run come to an end Tuesday afternoon with an 8-1 loss to Dover. Washington C.H. finishes the tournament with a record of 2-2. “I am so proud of the boys,” Washington C.H. manager Jason Waters said. “And my coaching staff and how well we competed against the best competition in the state at the highest level. “It amazes me how these boys were able to bounce back from a tough loss against Olentangy to get a great victory (Monday) against Wheelersburg,” Waters said. “And how well they competed against the State runner-up from last year, Dover today. We were really in that ballgame. We had some errors and misplays and some calls going our way could have made the difference and made for a closer outcome. “I think the kids had a great experience at the tournament,” Waters said. “I’m proud of the deep run they made into it and the effort and attitude that they displayed. I’ll always remember this team and this group of players and how they came together and how hard they played for us. “They’ve made their place in Washington C.H. Little League history,” Waters said. “Our Little League program is something to be proud of. Our community really creates some great baseball players. Tanner Lemaster started on the mound for Washington. Dover had two hits in the top of the first, but Washington was able to turn a double play to end that inning. Washington went out in order in the bottom of the first. Dover was set down in order in the top of the second. In the bottom of the second for Washington, A.J. Dallmayer led off with a single. The next batter hit into a double play and the following batter was retired to end two innings of scoreless play. The third was a scoring inning for Dover. A lead off double eluded a diving Tyler Tackage at third base. A sacrifice bunt moved that runner to third and a passed ball made it 1-0, Dover. A single and an error by Washington gave Dover a runner at second. An infield hit and another error made it 2-0. The next batter hit a triple with Brady Armstrong making a diving attempt at the ball in left field. An RBI single gave Dover a 4-0 lead. In the bottom of the third for Washington, with one away, Lemaster drilled a ball off the wall that went for a single. Tate Landrum was sent in to pinch-run. The next two batters, however, were retired to end three innings of play. Dover had a double in the fourth, but did not score. Washington went up and down in order in the bottom of the fourth. In the fifth for Washington, Mason Coffman walked and was sacrificed to second by Cole Little. Coffman reached third on a passed ball, but was stranded there. Dover held a 4-0 lead after five innings. Little was brought in to pitch to begin the sixth inning. Dover scored four times in the sixth. In the bottom of the sixth for Washington, John Wall hit a home run with one out. The next two batters were retired, ending the game and the tournament run for Washington C.H. Dover was the State Little League runners-up in 2016. Offensively for Washington: John Wall, 1-3, one home run, one run, one RBI; Tate Landrum, 0-1; Tyler Tackage, 0-3; Bryson Sheets, 0-1; Jonah Waters, 0-3; A.J. Dallmayer, 1-2; Drew Guthrie, 0-2; Brady Armstrong, 0-1; Brayden Kettles, 0-1; Tanner Lemaster, 1-1; Wesley May, 0-1; Mason Coffman, 0-0, 1 bb; Cole Little, 0-0, 1 sac bunt.